Petpayu Pinsinchai is a young, fast rising nak muay from Pinsinchai Muay Thai gym in Bangkok, Thailand. Petpayu has headlined many cards from the Thai Channel 9 broadcasts from Asawindum stadium. 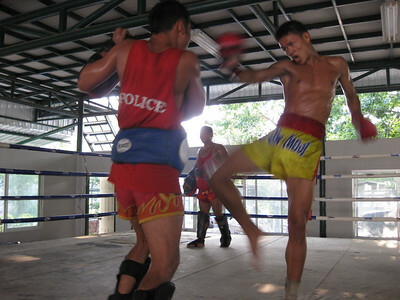 Asawindum stadium is also operated by General Sawake, owner and chief instructor at Pinsinchai Muay Thai gym. Petpayu is becoming known for producing devastating knockouts in Muay Thai using punches and elbows. Saul Khan as current resident and one of the few foreign nak muay present at Pinsinchai provides us with a conversation with the young stand out at Pinsinchai. Saul Khan will be fighting at the upcoming Naksu event held at Asawindum. How long have you been training at Pinsinchai? I have trained at Pinsinchai Muay Thai gym for 2 years. What do you like most about the Muay Thai style? It makes me strong and powerful, and it’s not dangerous as people say. Knees make it a strong style. I have mostly seen your fights on Asawindum programs for channel 9. Have you fought in other stadiums? Yes I have fought at Rajadamnern stadium one time and at Lumpinee stadium 4 times. My favorite stadium is Lumpinee. Recently Pinsinchai gym announced that they’d be opening to the public and to foreigners for the first time. How do you feel about training farang students? Many boxers come here from around the world to train with me. Foreigners would be my favorite to train. I recently saw your devastating knockout of Mongkonchai Kor. Kawinchai by elbow. Do you favor elbows as a technique? Yes, but my favorite weapon is my powerful punches with both left and right hands. Saul has told me that you once out lifted a 98kg power lifter. Can you tell us how that contest happened? It was not a contest. I could perform better than the power lifter because of the length of time I have been training has made my body very strong. What makes Asawindum Muay Thai gym different than other camps? The owner of the camp, General (Sawake) Pinsinchai has 50 years of experience in Muay Thai. He trains us himself very extensively every day. I’ve heard you also have some interest in competing in international boxing. What do you like most about international boxing? I prefer international boxing to Muay Thai. I like the offensive and defensive skills. The fights are easy compared to Muay Thai and I can have a longer career than Muay Thai. And I want a long career as a fighter. What fights do you have coming up? On the30th of May, 2010 I will fight against Chalaamthong, 118 lbs at Asawindum stadium. The card will be broadcast on Channel 9. What sort of style best describes your Muay Thai? Technical or more power dependent? I prefer a hard punching style that is also technical. I enjoy hitting them and not being hit in return. How is it training and living so far from your home and family? I think about it only a little bit. What are some of the things you do to help Asawindum every day in addition to fighting and training? Every day I sweep the yard clean, I water the plants and trees around the gym. I bring coffee and tea for the General and I help massage the other boxers. What would you do if another camp asked you to fight for them? I would say “no” absolutely. Why would you say no so strongly? I love and respect the camp and the General. I learn a lot of new techniques from him and if I left maybe I could not learn and become stronger. What are your aims in Muay Thai? I want to become the Lumpinee champion at my current weight (118lbs). What are your aims in international boxing? I would like to become a champion and to fight overseas. I also would like to see England and fight there. Who are people you look up to in international boxing? I like Manny Pacquiao’s style. I hope one day I can meet him. Here is a clip of Petpayu Pinsinchai Vs. Mongkonchai Kor. Kawinchai from November 2009 card at Asawundum Stadium.